Blue Button Jellyfish (Porpita porpita) blue jellyfish with fringe. Blue Button (porpita porpita). Photo by M. Crowther. Taken on Miramar Beach, FL. Note that there is another, jellyfish just to the left of the blue button. I believe it is a Purple Jelly. Both are in a plastic cup filled with seawater. 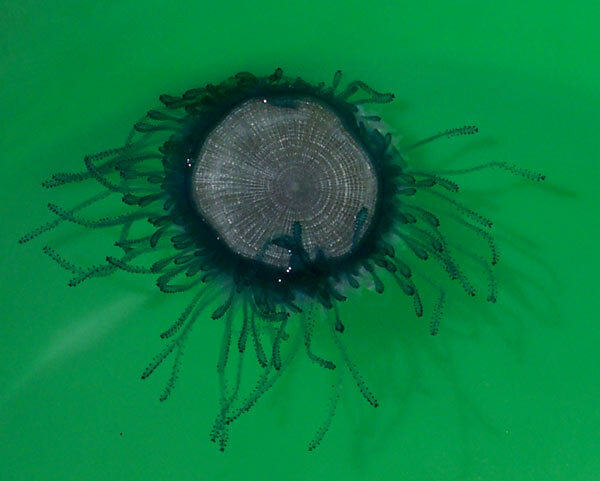 Blue Buttons are a type of jellyfish classified as Chondrophores. These are actually colonies of polyps (similar to the Portuguese Man-of-War). In other words, they are like a tiny colony of animals. Each animal contributes something different to the colony. Some form the central disk, while others form the tentacles. Blue buttons exist in colonies, and mass beachings frequently occur since they are at the mercy of the wind and water currents. Blue buttons generally measure 1.5 inches across or less, and are generally dark blue or turquoise in color, although a lemon-yellow color variant is said to occur, though I've never received any field reports of the yellow variation. The above video was shot by Julie U. in Daytona Beach. She and her mom Janet captured the blue button and were carrying it around trying to see if anyone knew what it was. Field reports indicate that in general, humans do not feel a sting when coming into contact with Blue Buttons. However, I have received several reports of individuals who say they felt either stinging or skin irritation from contact with Blue Buttons. To view my database on Blue Button (Porpita) sightings reported to me since June 2006, visit my blog post about Blue Button sightings. 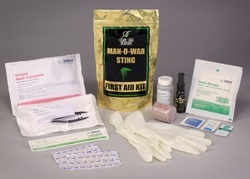 Ocean Care Solutions provides effective, medically supported First-aid pain relief products for marine stings including Portuguese Man O War, Stingray, Sea Urchin, Fire Coral and, a variety of jellyfish sting injuries. Above Blue Button photographed at Navarre Beach, FL. Copyright 2007 Michele B. Sometimes Blue Buttons can be so small they are hard to find. I'm holding this one in my hand, looking at the underneath side of the jellyfish. Note that some of the blue fringe tentacles have come off and are clinging to my middle finger, below and to the right of the jellyfish.